This is a sponsored post from Officeworks. 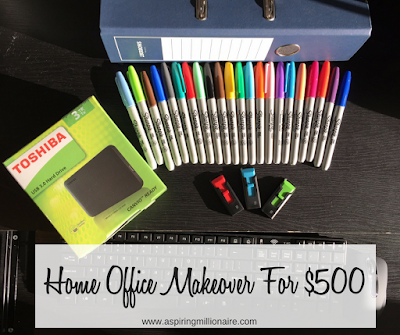 A $500 gift card was provided for me to select specific items for my home office. Opinions are my own. What to do when your desk is overrun with photography gear, notes, books and more? Get an office makeover. We are fairly practical people, we know what we want and don’t need extras to pretty it all up. We want a workspace that does everything we need. My partner is a photographer, videographer and one of the top marketers in the country. He was pretty happy with his setup until I said, we should go to Officeworks and ‘get a few things’. We were given a $500 gift card to go shopping with and easily came in under budget. 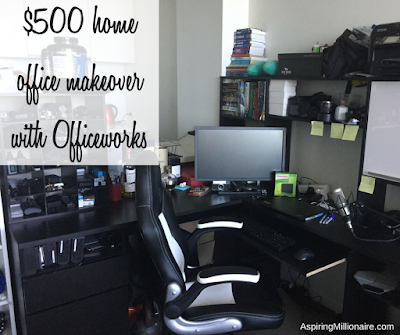 When we first moved into our tiny unit Officeworks was our first stop for our printer, two bookshelves, stationery needs and other basic business items. They had the lowest prices, the team were the friendliest and easiest to deal with. Our needs for our businesses are very similar and while we have made do with sharing some things since we live in such a small space, it was time to set up our workspaces properly. His was mostly storage and organisation, mine was more involved, which you can see here. He had some random travel gear, papers and things he needed but only occasionally. We took some of this from his workspace and put it in a storage tub in the wardrobe. You can see in his before picture he had a chair already. It was kind of old, didn’t support his back fully anymore and was a bit clunky. Funny thing about this is my partner grew up in Bathurst, so to now have something named after where he spent his teen years was amusing. It is super comfy though and I love that we have matching chairs. He liked it because it is black and white like his football team (Collingwood), it is comfortable, the arms are adjustable so can be moved up completely if desired and the back is a good height. We have both heard the benefits of this for some time, but neither of us had researched too much into it. The Wynston is adjustable, small enough to not take up the whole desk but large enough to fit his large laptop, a notebook and pen as needed. It folds down so small that it easily fits between our desks when he needs his whole desk for editing or camera gear. My sharpies are mine and no one else is allowed to touch them, ever. As such, he had to buy his own. For some reason, the kids got hold of his last ones and I have no doubt they will get a glimpse of these and want them too. Labelling anything and everything for when we travel is a must. My partner has such expensive gear that having a Sharpie on hand to mark everything as soon as we buy it is important. We also have a bit of a thing for colour coding certain things so having an array of colours, both light and dark makes this so much easier. Flyers on travel, brochures, things he wants to buy, all these papers usually end up all over his desk. With this simple binder he can section it into travel he wants to do, work opportunities and a final section for things he wants to buy. As papers come in, they can be filed and are easy to find when needed. With photos and videos from shoots, presentations to deliver at work or conferences and articles he writes, USB drives are essential. While everything is backed up to the cloud, having USB drives we can use with clients makes life easier. Bluetooth headphones. He has a set but the earpieces haven’t always been the best. We decided on Plantronics Voyager Legend Bluetooth Headset for $138 (outside the $500 budget and not solely for the office). Acer KA240H 24” monitor. This is something we both considered. He has one extra monitor, but has previously worked with three and prefers it. Lenovo Tablet. My kids got new tablets for school and now I want one. The Lenovo 7” one is a good size, plus very affordable. Basics. We get our batteries, post it notes, notebooks, pens and other essentials at Officeworks. We live close to one so often pop in and pick up what we need when on the way home. It’s quick, convenient and the team are super helpful. We knew we needed stand up desks, office chairs and storage options for my partner’s photos. Plan it out before you go shopping so you don’t end up buying a bunch of stuff you don’t need. I tend to shop online, add things to the cart, see how much it all is and work out where it will go then head in store to see my favourite items in person, sit on chairs and find what works best for me. As you can see, $500 is a great budget which will get you everything you need. You can get desks and chairs at Officeworks for less than we spent , but I was really specific about what I wanted. You need space to work. Declutter your desk, get rid of old papers, work out what you need your space to do so you can work effectively and set it up that way. Officeworks has a Lowest Price Guarantee, so you can compare prices and know you are going to get the best price. Shop around, find what you want and set your office up within your budget. 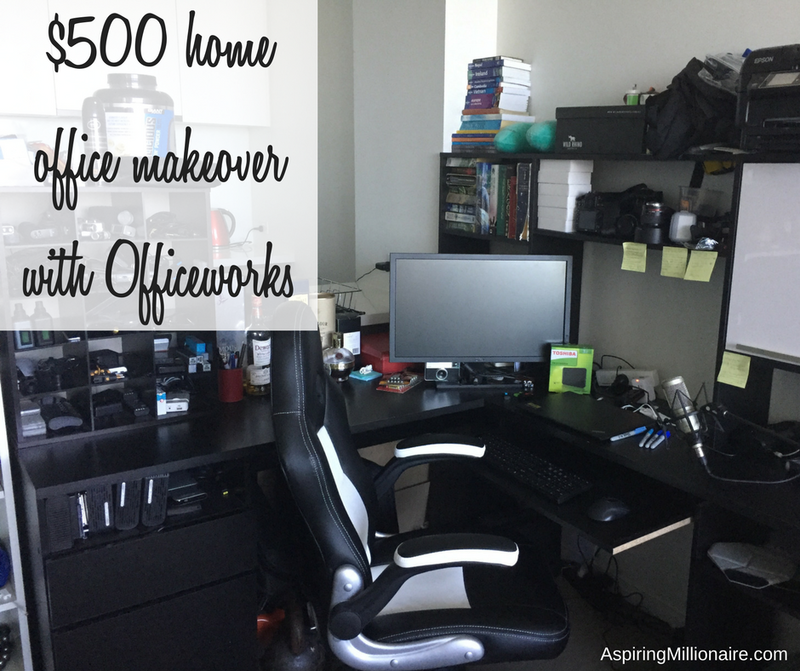 What are your home office essentials and what would you spend $500 on at Officeworks?